I missed the chance to blog about some interesting things last year, due to being in China and not having access to WordPress. 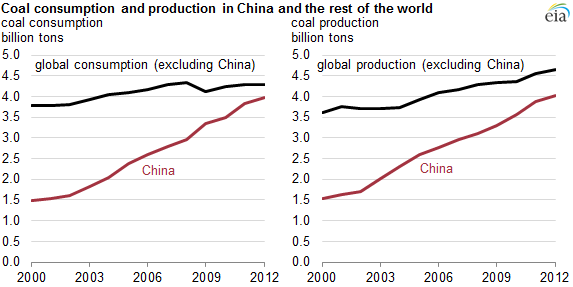 In May of 2014 the DOE’s EIA published a report on China’s coal production and consumption. Given that China recently made an agreement with the U.S. about future emissions, the DOE report is worth another look 8 months later. In 2012 China consumed about 103.6 quads, close to 20% of the world’s total. 70 of those quadrillion BTUs were produced by burning coal. China intends to double its energy consumption between 2014 and 2026. The EIA projected that China would burn about 162 quads in total by 2030 and that China’s reliance on coal will drop to 63%. If they are correct, the quads produced by coal in China will go from 70 in 2012 to 102.5 quads in 2030. That is a lot of coal to be burning. For perspective, the entire world including China used coal to generate 157 quads last year. However, I think it is actually worse than that. I project China’s energy consumption will rise to 246.6 quads in 2030 and that coal will provide about what it does now–70% of the total or 172.6 quads. That’s because I believe China will continue to accelerate their consumption of energy until they match Western per capita levels. They were at 59 mbtu per person back in 2010. The U.S. was at about 309 mbtu. Do the math. That would mean 172.6 quads produced by burning coal. By China alone. Just to remind you all, that’s why I’m worried about climate change. Even with a low sensitivity of the atmosphere to concentrations of CO2, at some point there’s just too much CO2.